Paulus Orchards is participating in the Community Supported Agriculture program commonly called CSA -or – the Weekly Fruit & Veggie Club! Get the best fruits and vegetables for your family by buying local produce. What is Paulus Orchards CSA? The basic idea of CSA farming is a cooperative relationship between the farmer and his customers. Based on an annual commitment to each other, community members provide a pre-season payment to purchase a “share” of the season’s harvest. The member receives a weekly box of a wide variety of fresh, in-season fruits and vegetables as well as the possibility of other farm product treats such as our own baked goods throughout the growing season. A share is a weekly box of local, fresh, sustainable produce that is picked up or delivered each week for 18 weeks (week of May 26th through September 22nd). There are 2 types of shares – personal and full. Our shares include a mix of fresh fruits and vegetables and from time to time other treats (for example homemade cider donuts, homemade jam, new recipes to try). Your share will reflect the growing season – the contents will always be changing. The first 2-3 weeks are light because the growing season in PA is just starting but as we head into summer the shares are “fuller.” For example, the very first share might have asparagus, spinach, lettuce, red beets, spring onions and apple cider donuts (it’s usually just produce but since the start is light we sometimes through these in!) and a share a couple weeks later might have these 6 items: strawberries, rhubarb, asparagus, bok choy, spinach, and red beets. Then in late summer it might be peaches, apples, sweet corn, tomatoes, cucumbers and cabbage. The full share has more of the same items – for example a quart of strawberries vs a pint for the personal. Some of the different items you will see throughout the season may include: strawberries, rhubarb, bok choy, blackberries, snow peas, sugar snap peas, spinach, lettuce, cabbage, tomatoes, onions, sweet corn, blueberries, summer and winter squash, peaches, nectarines, potatoes, green beans, green peppers, apples, brussel sprouts, zucchini, yellow squash, plums. 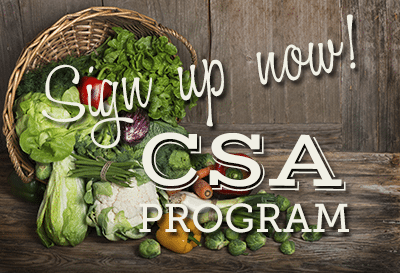 Being a CSA member is a season-long commitment to our farm, and in return we provide you with the best produce and family farm experience. In addition, you will receive 10% off all u-pick (strawberries, blueberries, blackberries, black raspberries, apples, and pumpkins) as well as 2 free Corn Maze/PlayLand tickets per share purchased! You will also receive an email each Monday letting you know what will be included in that week’s share. This is a larger portion of produce: ideal for a family or a couple that loves eating healthy! The full share is approximately a half-bushel box of produce each week – the first few weeks are *light* due to the growing season just starting and later weeks are heavier but on average you will receive about a half bushel of produce each week. The full share is $399 for the 18 week season – which is only $22.17/week! The personal share is ideal for a single person or a couple on the go who want to enjoy fresh produce but don’t want as much as the full share. A personal share is approximately a peck of produce a week – again the first few weeks are lighter but the quantity increases as we head into summer with an average of a peck over the course of the season. The personal share is $299 for the 18 week season – which is only $16.61/week! We serve the following communities: Boiling Springs, Camp Hill, Dillsburg, Dover, Etters, Mechanicsburg (17055 and 17050), Mount Holly Springs, New Cumberland, and York Haven. You can pick up your share on Wednesdays between 12:30pm and 7pm at Paulus Orchards or one of our delivery locations in Dover, Etters, Mechanicsburg 17055, or York Haven (May 29th through September 25th). (Full addresses are provided during the check-out process.) The advantage of pick up at the orchard means the produce will be kept in our cooler until you arrive whereas the advantage of another location means it may be closer to your home or work – you choose whichever is best for you. Interested in being a Host? Hosts for 2019 are in place, but we would love to talk to you about 2020. Hosts receive a FREE Full Share if 20 or more shares are delivered to your location. Hosts receive a Half-Price Share if 10 or more shares are delivered to your location. Contact us in NOVEMBER to be considered for the following year. Host sites and transportation routes are determined in November and December so that they can be advertised December-May. What if I am on vacation or unable to pick up my share? Please try to arrange for someone else to pick up your share if you are unable to do so. It’s a great way to introduce the program to a friend or neighbor! All shares not picked up become the property of the site host (either Paulus Orchards or the delivery host).